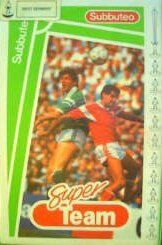 This was a range of top club and national sides, advertised in the Italia '90 catalogue, and sold in a special box, which resembled a video cassette case. The catalogue lists twenty five teams, but others have been spotted (including France, Belgium and St Etienne), so I'm unsure how many exist. However, although they were sold by name, there is nothing "super" about the teams themselves. They are exactly the same as their counterparts in the normal numbered range. The possible exceptions to this are Anderlecht and Real Madrid. In the normal range of 1990 they share the same number (691), but in this range their trim seems to differ in colour. Mind you, this same trim variation also shows up on the two pictures of 691 within the 1990 catalogue. In the 1990 catalogue these teams seem to have been displayed in a random order. However, for this page, I've divided them into club and national sides arranged in alphabetical order. The club sides seem to be drawn from the successful European teams of this era - so Norwich City become a slightly unusual sixth English side in the range. For each kit I've put the 1990 range number in brackets. A C Milan (057) - note the Scudetto on this illustration.